Lawns have long been the sign of a well-kept garden. Yet increasing awareness of the ecological benefits of variety, not uniformity, has challenged the long-established order. Pristine, flat, consistent & uniform- the perfect lawn is the goal of many gardeners. Seen as the hallmark of true gardening excellence, it’s become a stereotypical, even clichéd, obsession among middle-class, suburban gardeners. There’s a great deal of attention paid to this area of gardening, with many products available promising the perfect lawn. For many it’s a timeless and constant goal, and good for those who choose to pursue it! But increasingly a new trend is overtaking our gardens: the wild flower meadow. For many years, wild flowers have been on the decline in developed countries due to the widespread uses weed killers, yet as more and more research into the role wild flowers play in our ecosystem is carried out, gardeners around the world are stepping in to revive this once-universal outdoor environment. Benefits to insects, birds, and other species are far more pronounced than on lawns: variety encourages a wide range of species, in comparison to the narrow benefits provided by the very mono-cultured lawn. Delivering all the benefits to drainage & flood control that lawns do, meadow creates a beautiful, low maintenance surface that thrives even with low fertility. Bees love the flower rich environment which extends from Spring to Autumn, which also helps preserve many of the native flowers and grasses that are being slowly lost in the countryside to chemical-heavy industrial farming. Gardeners of all abilities are increasingly rejecting the traditional high maintenance lawn, now able to achieve an attractive and fragrant field of native flowers without the need to fret over poor pigment, bald patches or uneven edges. 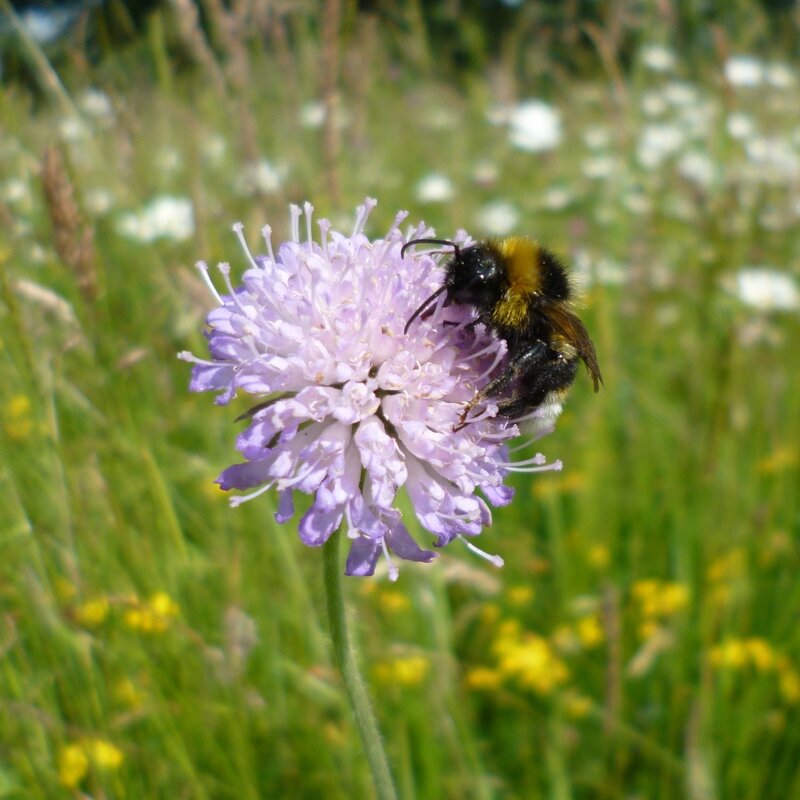 Without needing mowing, fertilising or scarifying, it increases local bee populations that boost flowers around the area while preserving a much-loved species that remains in decline with potentially catastrophic consequences. It has to be said that it’s unfair to criticise the humble lawn too much. The wonder properties of turf are becoming increasingly widely known, and in providing a practical, usable, safe space for relaxing, a lawn is simply fabulous. Many lawn-minded garden owners are taking up the call to promote ecological balance in other ways, with borders, containers and baskets springing up around the country to support the bee population, among others. Indeed, compared to many of the destinies shared by our unloved and all too often neglected gardens- the lazy, ugly unholy trinity of concrete, AstroTurf or decking, which truly eliminate any chance of ecological usefulness, guaranteeing increased water run-off and depleted wildlife- a lawn is practically a godsend to the local ecosystem. It’s important to note there are many plus sides to keeping a lawn, and a wider variety of options means more gardeners- something that can only be a good thing! If you’re considering establishing an eye catching, fragrant wildflower meadow, with all the benefits to wildlife that that entails, check out our amazing meadowmat- an ingenious, easily-laid, ready-grown meadow that quickly establishes in your garden to provide a great resource for insects, bees and birds.